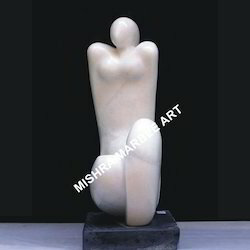 We offer a wide range of White Marble Sitting Statue to our clients based on different themes. They are finely crafted by the master craftsmen, whose master strokes bring life to the stone. Clients can avail from us a very intricate and artistic Marble Temple or shrine in which a deity’s statue is placed. This temple or shrine can be placed at homes in the area of worship as it is small is size. The hand carving done on this marble temple is intricate and detailed. 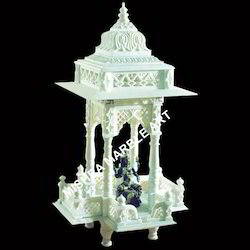 We offer this marble temple in customized designs, shapes and sizes as per clients requirements. The marble table clock, we offer is an excellent gift item and a showpiece for displaying on the desktop or study table. This watch is one of a kind with a beautifully crafted marble chassis in which the dais in embedded. 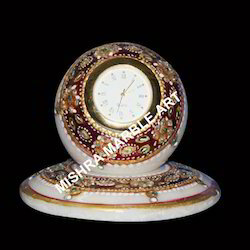 The alluring carving and painting done on the body of this marble watch makes it an antique piece. We market this marble watch at economical price. Looking for Marble Painted Handicrafts ?